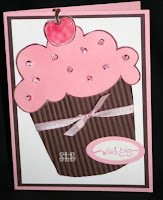 Roaming Stamper: Love this cupcake! From the minute I saw this stamp set in the new catalog, I loved it! I mean, who doesn't love a big cupcake! It was on my first order and I've hand a lot of fun coming up with cards for it. This one is one I really love though. First off, I love the "cupcake" liner, secondly I used beads for the "sprinkles" on the top and I love the 3-d look of that. The cherry has crystal effects on it so it looks so real. All of these elements make this card a favorite. This set, Simple Birthday Thanks, has words in the bottom part of the stamp. Because I knew I'd probably never use the words, I used an exacto knife to cut them out. I saved them in case I ever want to use them but because I did cut them out, it makes this set so much more versatile. Oh and because this is Stampin' Up! 's 20th birthday this set and many other birthday sets are on sale until the end of the month. Purchase $20 in merchandise and order any of the special birthday sets for 20% off! All products from Stampin' Up! I love all the details on this card; the crystal effects cherry, the beads and most of all the crimped cupcake holder!! Good idea cutting out the words-makes this set more appealing! !